The Earth’s population is increasing, but at the same time the amount of suitable farmland is decreasing due to factors including climate change and the growth of cities. Producing sufficient food to feed everyone is a global challenge. 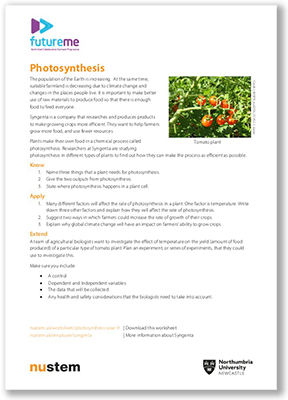 This worksheet builds on students’ knowledge of photosynthesis and plant growth in the context of this area of applied research. Click to download PDF worksheet (305kb).